Don’t let the winter blues get you down… put on a bathing suit and dive into a fun and adventurous sport! For some people winter diving is the best way of maintaining dive fitness to prepare for a new season, while for others, it is much more than this. Below are some of the best winter dive destinations sure to leave you breathless! Colorful water with diverse marine life in a sunny and cool environment is what awaits you in Maldives atolls in winter. This stunning tropical paradise warmly welcomes divers from all over the world to take part in exclusive whale shark safaris, which are very attractive in winter. Winter diving in Maldives is ideal for advanced divers looking for underwater photography and drift dives. Maldives offers amazing diving in North Male Atoll, where diving sites are characterized by wonderful coral reefs, drop-offs, caves and marine life. Get ready to interact with plenty of sharks and mantas. Maldives normally enjoys the best visibility between December and March. From Ambergris Caye to the dedicated out-island dive resorts; ‘Island Dreams’ brings you the best of Belize. Belize is home to the second largest Barrier Reef in the world, stretching over 170 miles long from north to south and to three of the four atolls in the Caribbean. If you want to explore the virgin untouched environment of Belize’s Barrier Reef to your heart’s content, plan a winter diving vacation and you’ll never regret. Get ready to see over 400 species of fish and at least 70 types of hard coral, plus a variety of large sponges and gorgonians. 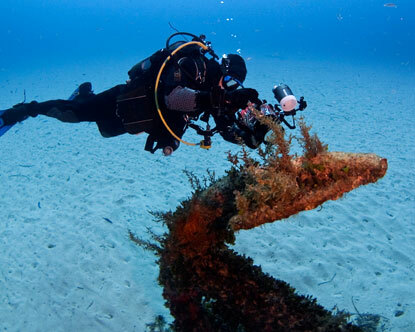 If you are looking for the ultimate Mediterranean diving experience in winter, consider Malta diving holidays. The clear and tideless waters of Malta teem with stunning underwater life, and there are also fascinating wrecks that have been cleaned and sunk at various diving sites around Malta. Do not miss out the scenic dives at locations like the Comino Caves and Lantern Point. Winter diving in Arctic Circle offers endless crisp air and snowy shorelines. Moreover, it can sometimes bring you up close with icebergs, scattered in a blue and white world of extreme clarity that often exceeds 40-50m. If you are crazy enough to do it, do not look further and head to Arctic Circle – the area surrounding the north pole of earth. Make sure your regulator is rated for cold water. This is required when diving in water less than 6°C. Dive in a dry suit. A good under-suit combined with a dry suit will keep the cold out. Do not forget about special training while diving in a dry suit. Put on dry, semi-dry or wet dive gloves. Dive with a hood to make your adventure comfortable. A good hood should be at least 3mm thick and fit snugly. Diving in winter truly has much to offer but you will never appreciate it unless you give it a try!